Furious motorists have vented their anger over the dangerous state Horsham’s roads. 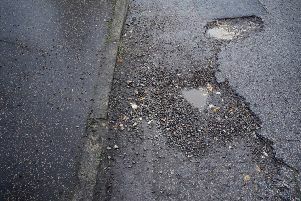 Angry drivers have taken to the County Times Facebook page to express their dismay at the state of roads in the district, following a reader letter which compared Horsham’s ‘embarrassing’ roads to ‘ploughed fields’. Josh Packham fumed: “Try Hayes Lane in Slinfold, a better ride than most of Thorpe Park. Ruth Kenward told how a roundabout near her is ‘very hazardous’ due to cars ‘swerving suddenly to avoid the potholes’. Read more: Will this Horsham town centre bar’s new door policy affect you? Susan Goldsmith blasted the repairs as an ‘absolutely disgusting waste of resources’. She added: “Every year, WSCC repair the huge (dangerous) potholes in our road (Meyers Wood-Partridge Green) and within THREE days the repair starts to break up and the holes are back within a week. “We then have to wait a YEAR for it to be repaired again...and again. Colin Wells said: “The road are dangerous, and to see repair teams fix half a pot hole or one pot hole and leave another three is just ridiculous. Yvonne Hyde told how the roads are ‘like a patchwork quilt’. She added that she was ‘always looking in fear’ for when the next pothole arrives. West Sussex County Council has since spoken out about the repairs.